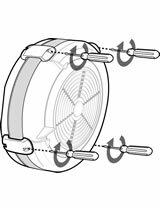 As you grasp the handles to use your SkiErg, you may be inadvertently twisting the cords, much like what would happen to the cord on a telephone hand set. Over time, this may cause the cords to twist around each other inside the SkiErg, resulting in a lumpy feeling when you pull on the handles. This may cause premature wear of the cord. 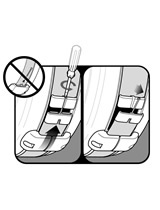 Follow this procedure periodically to untwist the cords. This is easiest when done with two people. Grasp each cord at the top and run your hand firmly and slowly down the length of each cord to untwist the cord. There are three separate cords and one bungee cord to inspect. Important! 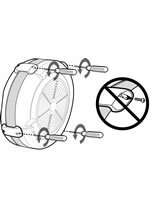 All cords are of a specific type and should be replaced with the appropriate Concept2 replacement cord if significant wear or damage is observed. See below for a description of cord wear/damage. The handle cord is a single cord connected to both handles and can be easily inspected by pulling the handles all the way out and visually checking for wear. 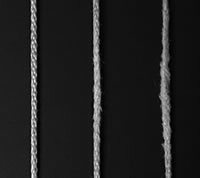 See below for a description of cord wear. 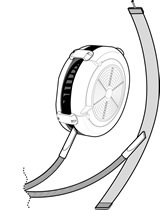 To inspect the cords working inside the vertical frame, the lower rear cover must be removed. If the SkiErg is mounted to a wall it must be removed for this inspection. Remove the lower rear cover by removing the six screws. This will expose the cord that winds onto the flywheel spool, the handle cord that winds onto the spool (this is a separate cord from the one attached to the handles), and the bungee cord. Have a helper slowly pull the ski pole grip handles all the way out while you observe the condition of the cords inside the vertical frame. Pulling the handles out will allow you to see the entire working length of these three cords. The cords consist of a solid braid (not a covering over inner fibers). Over time the surface will show fuzzing. If this fuzzing becomes worse in a localized spot on the cord it is time to replace the cord. See photo at right. 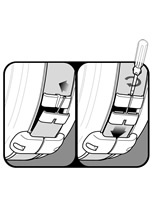 Check that all fasteners are tight and have not loosened during use. If your SkiErg is wall mounted, pay particular attention to the wall mount fasteners. 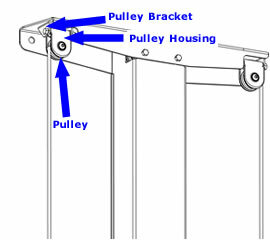 Check that the pulleys spin freely in the housings and that the pulley housings swing freely in the pulley brackets. See illustration at right. Clean grips and straps after each workout. Use a mild soap or cleaning product. Clean surfaces of the SkiErg with any household cleaner. DO NOT spray any fluid onto the monitor. 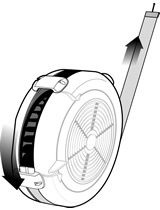 Dust and lint can collect inside of the flywheel enclosure. This can restrict airflow reducing the resistance of the fan. 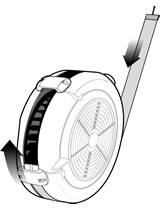 The outer cover of the fan enclosure can be removed for cleaning by removing the four screws connecting the cover halves. See illustrations below.